The TT Series remote-control transceiver is designed for bidirectional, long-range, remote-control applications. The module includes an optimized frequency-hopping spread spectrum (FHSS) RF transceiver and an integrated remote-control transcoder. The FHSS is capable of reaching more than 2 miles in typical line-of-sight environments with 0-dB gain antennas. An amplified version increases the output power from 12.5 to 23.5 dBm, boosting the range to more than 8 miles in line-of-sight environments with 0-dB antennas. 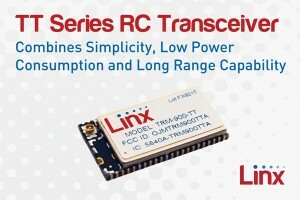 The TT Series transceiver features best-in-class receive sensitivity (up to −111 dBm) and low power consumption (only 19.2 mA in receive mode and 36 mA in transmit mode at 12.5 dBm). The initial version operates in the 902-to-928-Hz frequency band for North and South America. The transceiver is housed in a compact reflow-compatible surface-mount technology (SMT) package. It doesn’t require any external RF components except an antenna, which simplifies integration and reduces assembly costs. Programming is not required for basic operation. The transceiver’s primary settings are hardware-selectable, which eliminates the need for an external microcontroller or other digital interface. Eight status lines can be set up in any combination of inputs and outputs to transfer button or contact states. A selectable acknowledgement indicates that the transmission was successfully received. For advanced features, a UART interface provides optional software configuration. A simple pairing operation configures two modules to operate together. A single button press on each side causes the modules to automatically swap their 32-bit addresses and store them in nonvolatile memory. It can be configured to automatically send an acknowledgement to the transmitting unit either after receiving a command or with external circuitry when an action has taken place. An optional external processor can send two data bytes with the acknowledgement. 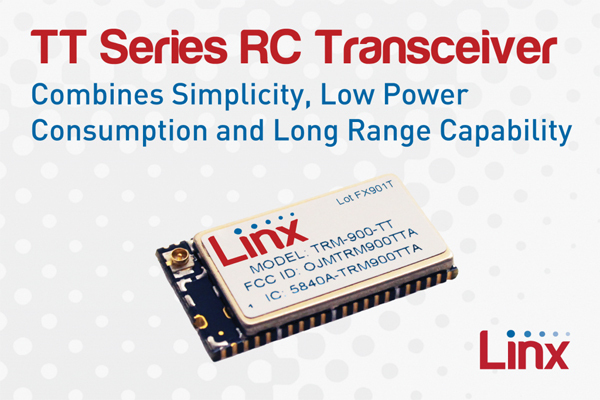 The TT Series transceiver module is available as part of Linx Technologies’s master development system that comes with two development boards for benchmarking and prototyping. Each board is populated with a transceiver, two remote-control development boards, and programming boards. The system also includes antennas, a daughterboard with a USB interface, demonstration software, extra modules, and connectors. Contact Linx Technologies for pricing. 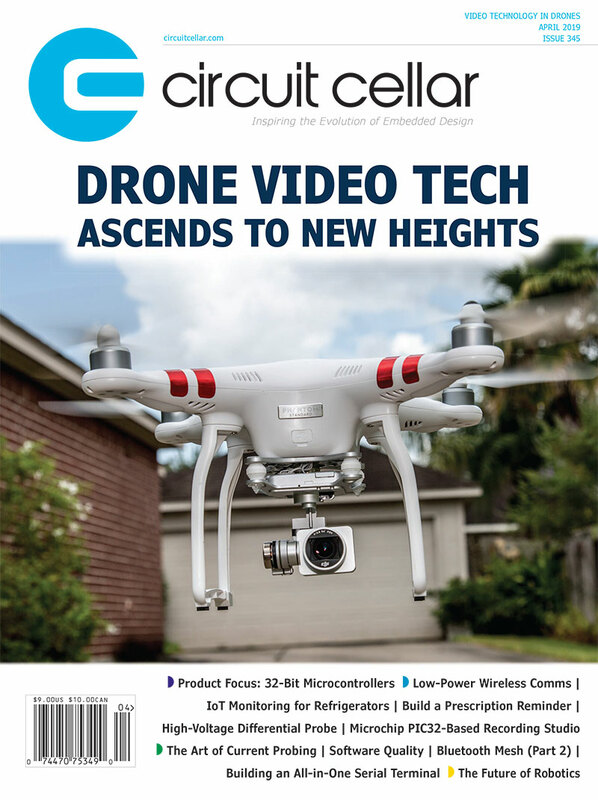 This entry was posted in Product News and tagged antennas, connectors, daughterboard, development boards, directional, FHSS, frequency-hopping spread spectrum, long-range, nonvolatile memory, remote-control transceiver, RF, SMT, surface-mount technology, transcoder, UART interface by Circuit Cellar Staff.